Louisa, Ky — Lawrence Co. improved to 12-2 on the year with a 10-5 victory over Huntington ( W. Va. ) on a beautiful evening for baseball Wednesday at Randy Keeton Field. Jackson Feltner is all smiles as his team mates wait to greet him after hitting his 4th Home Run of the year Tuesday vs Pikeville. 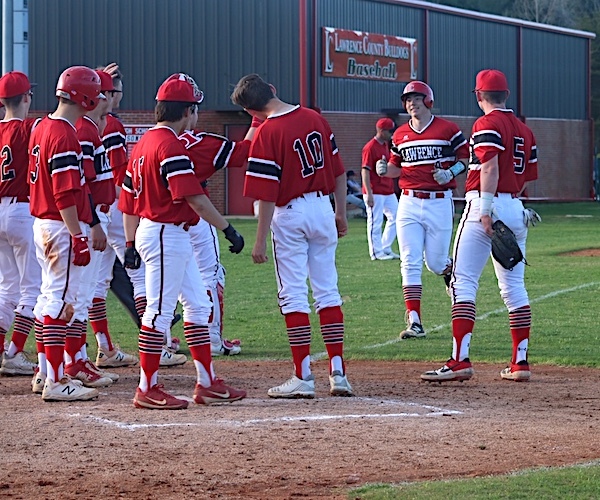 In a sloppy game on the defensive side that saw both teams commit 10 errors combined, but the Bulldogs scored 2 runs in the first and 3 runs each in the second and third innings to make up for the defense. 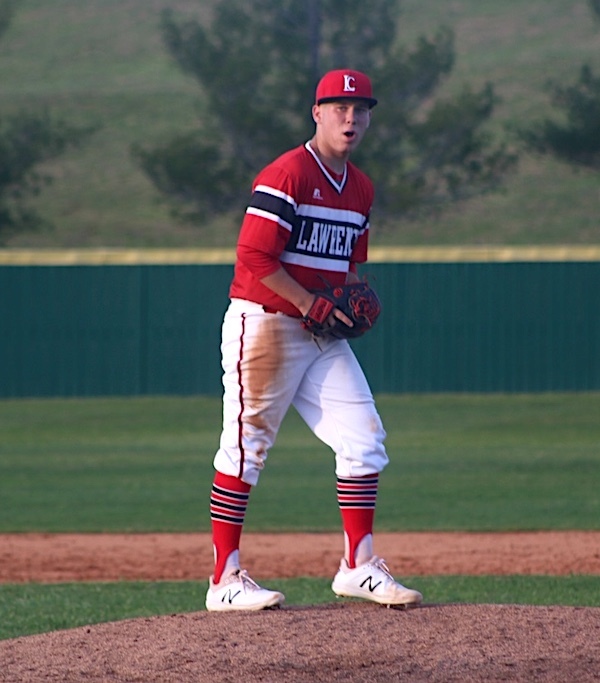 Jackson Feltner went four innings allowing zero earned runs to get the win and Jacob Fletcher allowed 1 earned run in his three innings of work to pick up the save. Bryce Blevins had 3 hits to pace the offense, Austin Roe had 2 hits and 2 RBIs, CJ Fairchild and Tyler Maynard had 1 hit and 1 RBI, Lucas Maynard had 2 hits including double and knocked in one run, Jackson Feltner doubled, Hunter Crum had 1 hit. 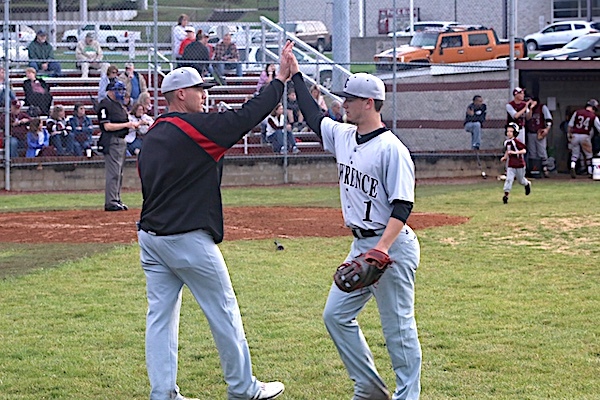 Bulldog Freshman Bryce Blevins threw a five inning, three hit shutout as Lawrence Co. beat 15th Region foe Pikeville ( 4-6 ) on Tuesday evening at Randy Keeton Field. Bryce Blevins was sharp once again on the mound in a home victory over Pikeville on Tuesday. Blevins also helped his cause offensively with 2 hits and 2 RBIs, Jackson Feltner belted a solo home run his 4th of the year, Tyler Maynard had 2 hits including a triple and knocked in one run while scoring 3 times, CJ Fairchild, Austin Roe, Jacob Fletcher and Lucas Maynard had 1 hit each, Ethan Whitt had 1 RBI. In their first game after spring break the Dawgs fell behind 6-0 before a big rally the last three innings fell short on the road. Ethan Whitt finished with 3 hits and 2 RBIs, Lucas Maynard 2 hits and 1 RBI, Jackson Feltner and Jacob Fletcher 1 hit and 1 RBI, Austin Roe and CJ Fairchild Doubled, Bryce Blevins and Tyler Maynard had 1 hit each. Hunter Crum and Tyler Blackburn both pitched well in relief of starter Tyler Maynard who suffered the loss. Tyler Blackburn is is greeted by Head Coach Travis Feltner after a couple of good innings on the mound vs Ashland to keep the Dawgs in it. Lawrence Co. will return to action on Saturday afternoon at home against Boyd Co. at 1:00.